I finally just finished setting up my holiday decorations for Christmas. It’s so nice to get them up and done. Some years I tend to procrastinate and end up waiting till mid December, but this year I made things easier on myself and started in November. I’ll be sharing more of my holiday decorations with you this week! One of the first things I decorated was my mantle. 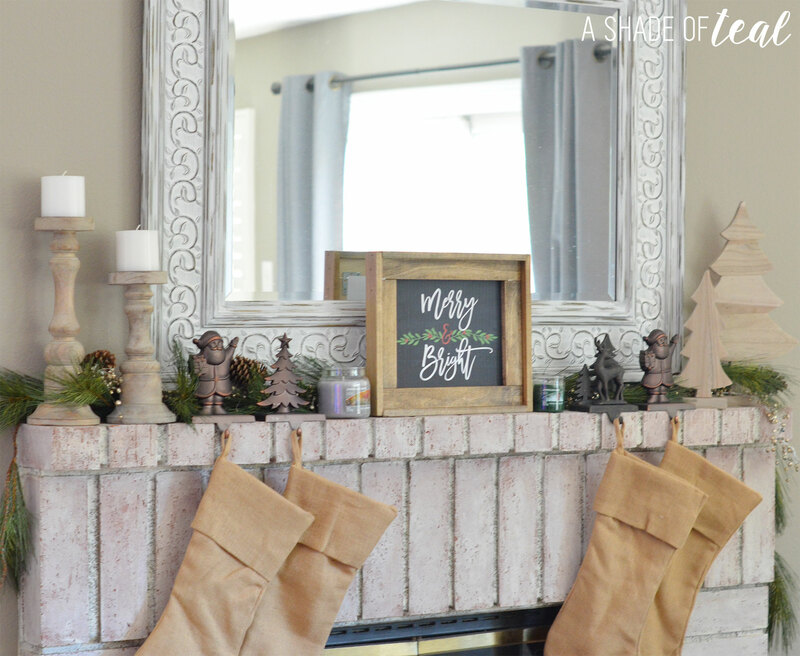 It’s also one of my favorite places to decorate; maybe because it’s in our family room and we enjoy it every day, but hanging the stocking’s and garland gets me motivated to decorate the rest of my house. 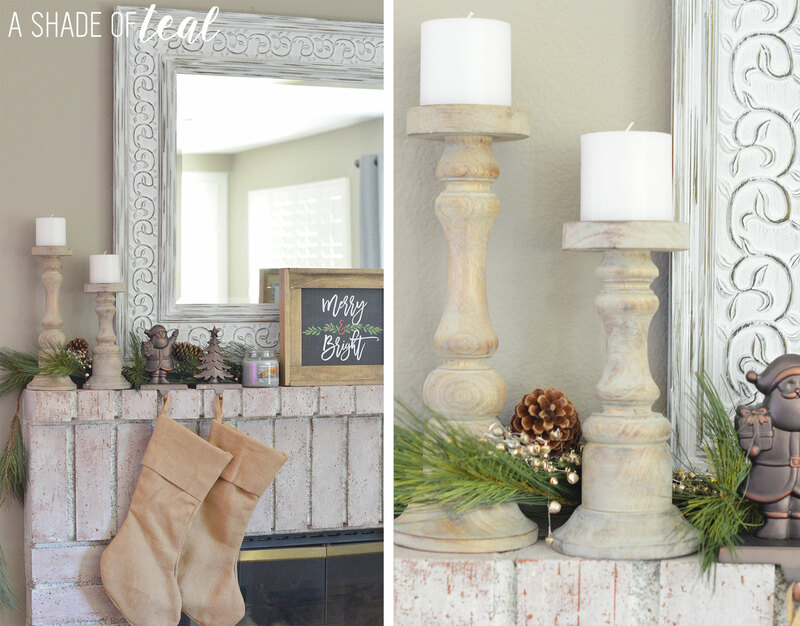 This year I updated my mantle decor with a new Rustic Wood Frame and some candles from American Home™ by Yankee Candle®. Of course I had to make the wood frame, but the candles I found at Walmart. 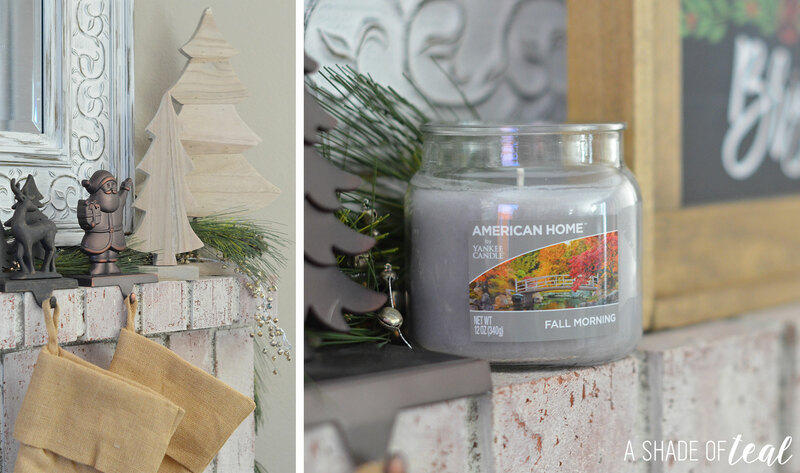 Their American Home™ by Yankee Candle® collection has some amazing holiday fragrances to get you in the holiday spirit. I purchased the Fall Morning, Homemade Pumpkin Pie, and Fresh Balsam Fir. These are all great fragrances to gift to loved ones this holiday season, especially since they are inspired & have a true to life fragrance. All 3 will make a great holiday gift, but the Fresh Balsam Fir will really get you in the Christmas mood. I love using these candles to gift to co-workers, especially when you don’t know what else to get them. They’re also perfect for last minute gifts including stocking stuffers! I personally love burning them while decorating. Make sure to follow instructions while using American Home™ by Yankee Candle® brand products. I also suggest to always burn your candle on a heat resistant surface and never leave it unattended. If your looking to update your decor with a easy do it yourself frame, then here’s a tutorial on how to make your own 8″x10″ rustic wood frame. Wood, 1/2″ thick x 1 1/2″ wide. Cut 4 pieces 13″ long, 2 pieces at 12″ long and 2 pieces at 8″ long. Step 1: Cut the wood to size and lightly sand the edges. Step 2: Lay down 2 of the 8″ pieces and 2 of the 13″ pieces. Fasten with the L brackets. Step 3: Add the remaining pieces of wood with either a hammer & nails, or a nail gun. Step 4: Stain the frame. Step 5: Add your art to the back with tape, and display! 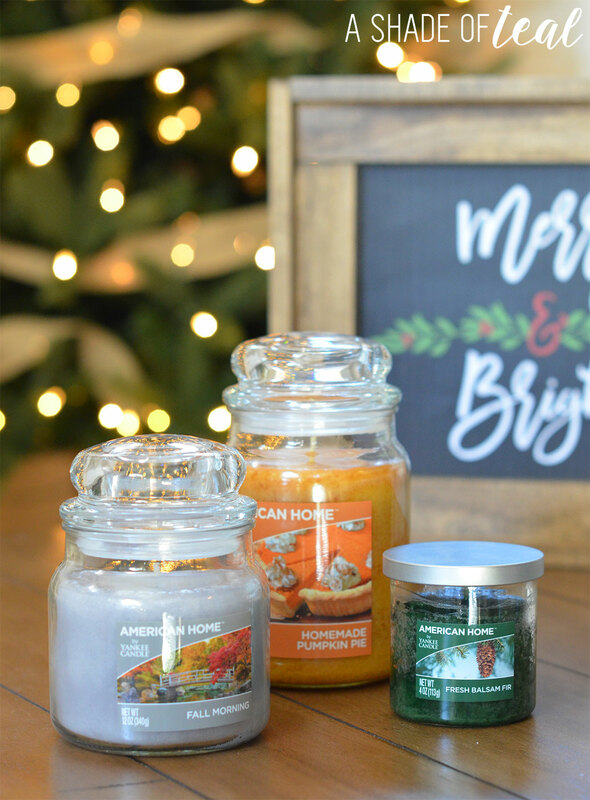 So whether you’re looking for stocking stuffers or last minute holiday gift idea’s, the American Home™ by Yankee Candle® collection is perfect. You can find the entire American Home™ by Yankee Candle® collection at Walmart in the Home and Candle section located in the home decor area of the store. Happy decorating and happy shopping this holiday season! Make sure to pick up a couple candles from American Home™ by Yankee Candle®. Playhouse Update, How to add a Roof! « Holiday Gift Guide: Top 10 Gifts for your Host! I am SUCH a sucker for candles!!!!!!! I need to check out the AMERICAN HOME brand! The file is setup as a pdf, but if you need jpeg please message me in Etsy before you purchase and I can setup for you. I love your eye for design! I think the frame is uber-cool and very professional looking. I’m just insecure about my craft skills. It looks so cutee! I need to add this to my Christmas decoration! This is an ideal present for neighbors or friends and it will be much special if it is made personally. Such a cool frame! And the candles from American Home. They are to CHECK OUIT NOW. The frame looks absolutely beautiful! You make it look so easy too. Somehow I don’t think that I can make mine as pretty as yours. lol The entire mantle look gorgeous! The candles look lovely! love the look of this! totally nice on where you put it very christmassy feel! Maybe i can try this one day when my DIY energy comes back to life thanks for the DIY post! I love Yankee Candles! Your mantle look gorgeous. 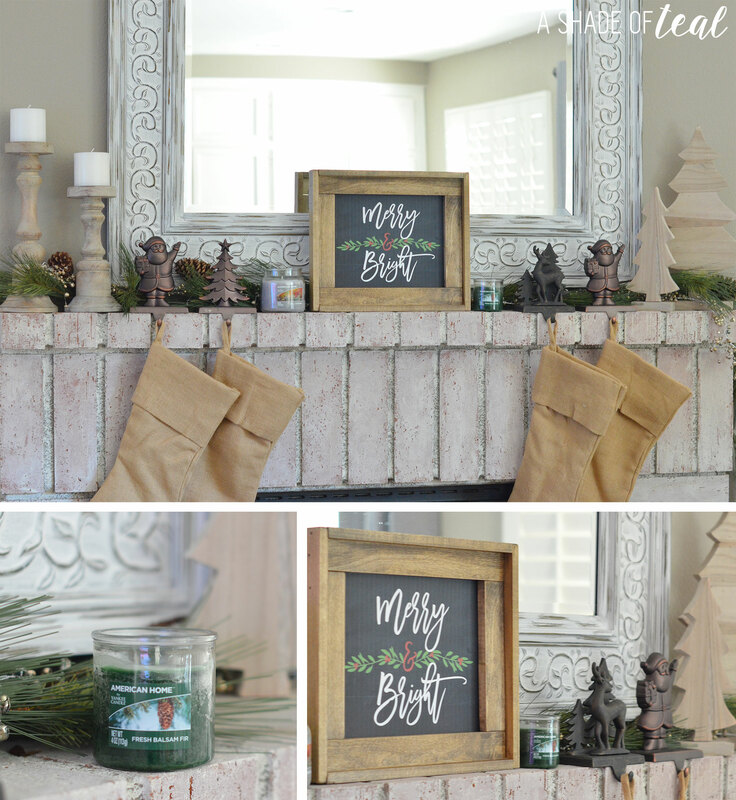 Thanks for the tips on how to make a rustic wood picture frame. It looks great. that’s such a cute idea. sharing with my brother who loves to make stuff like this. This is so cute! I am very into the rustic look when it comes to decorating so this is right up my alley. I love that wood frame! And so easy to put together wow. The mantle looks fantastic. I LOVE IT!! What colour stain did you use? It’s perfection!! Love this! What colour stain did you use? It’s perfection! Love the diy frame! I have a project I was needing to make frames for and this will work great for it. Thank you for sharing! Thanks so much Jen! I’m glad my tutorial helped! Your tutorial was great! I have a ton of my own paintings on canvas that need frames! May I ask where you got the wood? Did Lowes have this specific type of wood in stock or did you have to cut it down any? I had to cut it to my size. What stain are u using here! I can find one or a combo that I like…. Thank you for sharing. The frame is so nice and easy to make. I am making it to hang in our bedroom. Just a bigger size. Can I ask where you buy the candle holders on your mantle? Do you know what kind of wood you used? I was thinking a wood that wasn’t super heavy would be great to use as I will make a couple of these for gifts that would be shipped to BC! 🙂 great job !! I believe it was pine or popular. But it was pretty lightweight. This is such a cute idea! I am going to link this to my Christmas Budget post as a great DIY gift option! This looks great! I Love it! Does this come out to hold a 8×10 picture? Yes, but you can make the frame to any size you need. I love the whole display! The frame is so beautiful! I just bought 3 frames that were unfinished at a thrift shop. I can’t wait to try the stain combo! Thanks great! It’s by far my favorite stain color.